Objective To elicit women’s responses to information about the nature and extent of overdiagnosis in mammography screening (detecting disease that would not present clinically during the woman’s lifetime) and explore how awareness of overdiagnosis might influence attitudes and intentions about screening. Participants Fifty women aged 40–79 years with no personal history of breast cancer and with varying levels of education and participation in screening. Results Prior awareness of breast cancer overdiagnosis was minimal. Women generally reacted with surprise, but most came to understand the issue. Responses to overdiagnosis and the different estimates of its magnitude were diverse. The highest estimate (50%) made some women perceive a need for more careful personal decision making about screening. In contrast, the lower and intermediate estimates (1–10% and 30%) had limited impact on attitudes and intentions, with many women remaining committed to screening. For some women, the information raised concerns, not about whether to screen but whether to treat a screen detected cancer or consider alternative approaches (such as watchful waiting). Information preferences varied: many women considered it important to take overdiagnosis into account and make informed choices about whether to have screening, but many wanted to be encouraged to be screened. Conclusions Women from a range of socioeconomic backgrounds could comprehend the issue of overdiagnosis in mammography screening, and they generally valued information about it. Effects on screening intentions may depend heavily on the rate of overdiagnosis. Overdiagnosis will be new and counterintuitive for many people and may influence screening and treatment decisions in unintended ways, underscoring the need for careful communication. Mammography screening involves large numbers of women worldwide, with participants annually numbering over 840 000 in Australia36 and 2.1 million in the UK.37 The Australian mammography programme is similar to those in other developed countries: women are invited to a screening service whose leaflets emphasise the benefit without mentioning overdiagnosis (such as www.bsnsw.org.au/publications/early-detection-is-vital). To develop optimal strategies for communicating about overdiagnosis to women considering screening, better understanding of women’s perspectives on the issue is needed,38 including how views may vary according to the magnitude of overdiagnosis. We conducted a qualitative study to elicit women’s responses to information about overdiagnosis in mammography screening. We employed qualitative methods, which have been used successfully in previous research into women’s views of screening, their reasoning about participation, and the ideas shaping these decisions.39 40 A qualitative approach was well suited to the goals of this study which aimed to generate insights into women’s conceptual understanding and interpretation of information on overdiagnosis; to explore women’s evaluation of overdiagnosis including whether and how different estimates influenced screening attitudes and intentions; and to investigate views about provision of such information to the community. All study procedures were approved by the University of Sydney Human Research Ethics Committee. Participants gave written consent prior to participation. We recruited a community sample of women for whom making decisions about participating in mammography screening was relevant. Eligible women were aged 40–79 years, spanning the broad age range in which women commonly have screening. In Australia, women aged 50–69 are routinely invited for free biennial mammograms through the national screening programme, while women aged 40–49 or over 70 are eligible for screening on request but not actively invited. We selected Sydney suburbs that varied in socioeconomic status and approached potential participants by randomly sampling households in these areas using the electronic telephone directory. Recruitment was carried out via telephone by the Hunter Valley Research Foundation (HVRF), an independent non-profit organisation with extensive experience running community surveys and recruiting people into health research. To gain a diverse range of perspectives, we used purposive sampling to ensure inclusion of women with varying levels of education (that is, with and without post-school qualifications) and prior participation in screening (including low and high screening women in all age groups). We excluded women not fluent in English and women who had ever personally been diagnosed with breast cancer. Trained HVRF interviewers used a short series of questions to determine eligibility and compiled a database of women who had consented to contact by the researchers. We mailed study information to these women and then telephoned them to address any questions and invite them to participate. We conducted eight age-stratified focus groups, each comprising four to nine women, from July to September 2011. Sessions were convened in neutral focus group facilities distributed across three Sydney locations that were convenient for participants rather than in a clinical or academic setting. Each session comprised several parts: introduction and consent, baseline questionnaire, warm-up discussion, a detailed presentation on breast screening and overdiagnosis which was divided into sections and interspersed with guided discussions about the content, and a final questionnaire. Sessions lasted about two hours and were facilitated by a pair of female moderators (JH and either JJ or KM, all researchers in public health and psychology). Each participant was paid $A150 to reimburse her for her time and to cover travel costs. We provided all participants with a written list of organisations from which they could access further information about breast screening if desired. At each session, JH gave an audiovisual presentation that had been developed and reviewed by a multidisciplinary expert team of researchers and clinicians (see appendix 1 of supplementary material on bmj.com for example slides). The presentation explained overdiagnosis using a consumer friendly format (such as combining pictures with text and using plain language as much as possible). We presented a range of published estimates of the rate of overdiagnosis in mammography screening (1–10%, 30%, and 50% of breast cancers diagnosed in women participating regularly in screening), based on a thorough literature review (see appendix 2 on bmj.com for further details on these estimates). To put overdiagnosis in context, we also provided age stratified, evidence based information on the benefit in terms of breast cancer mortality associated with mammography screening in Australia.46 In line with evidence based recommendations,47 we illustrated cumulative outcomes in the form of natural frequencies using diagrams to show the absolute number of breast cancer deaths among 1000 screened and 1000 unscreened women, and the number of cases overdiagnosed in the screened cohort. Thorough pilot testing of the study materials and procedure among women in the relevant age range resulted in various refinements (such as replacing the term “overdiagnosis” with “overdetection” to avoid confusion with misdiagnosis). In the group discussions, women shared their responses to the information presented and how it made them feel about screening, as well as views on different strategies for communicating about screening. Box 1 summarises the presentation content and types of questions we used to guide the discussions. At the beginning of each focus group we made it clear that we would be talking about reasons why women might choose to have screening or not to have screening, and highlighted that we would not try to persuade them one way or another. We emphasised our neutrality throughout by repeating statements of this kind, by not labelling the figures presented (such as number of overdiagnosed cases) as large or small, and by not interpreting as positive or negative any views expressed by participants. Throughout the presentation, we strongly encouraged women to request clarification as often as they needed. Have you ever heard of overdetection or overdiagnosis in screening? After seeing and hearing this information about overdetection in breast screening, what are your thoughts or feelings? How does it make you feel about having breast screening? Given this rate of overdetection, how does it make you feel about having screening? If overdetection were [10% or less / 50%], how would you feel about having screening? Does it make a difference to you whether overdetection is 1–10% or 30% or 50%? Is overdetection something that you would have liked to have known about before? There are different approaches to telling people about screening. Currently the main approach is to encourage people to be screened; another is to give people information about pros and cons and let them decide. Which approach would you prefer, and why? *After some introductory general discussion about the concept of overdiagnosis, we presented and discussed the various estimates of its extent. We always started with the intermediate (30%) estimate, and then varied the order of the lower and higher estimates across groups. We asked women how each estimate in turn made them feel about screening. Note that for each estimate, a diagram illustrated the absolute number of overdiagnosed cases as well as the absolute number of breast cancer deaths averted per 1000 women screened over 10 years, so that participants could compare these figures. Focus group discussions were audio recorded and transcribed verbatim. Data were managed using NVivo 9 software. We conducted a thematic analysis, aiming to identify a set of main themes that captured the diverse views and feelings expressed. After the first few focus groups, the group moderators (JH, JJ, and KM) began the analysis by independently documenting and then discussing together the most salient observations from the group discussions. These impressions, together with the research questions that shaped the group discussion guide, formed the basis of the initial coding framework. Two researchers (JH and JJ) independently reviewed all transcripts, developed codes in an iterative process, and applied these to the data to identify patterns of ideas. Using constant comparison,44 48 we continually looked for similarity and differences in the data and our coding within and across transcripts. By comparing each part of the data with the rest of the data, we established analytical categories and selected key overarching concepts. Throughout this process we met regularly with KM and the research team to discuss the framework with which to interpret the data. We administered brief written questionnaires at the start and end of each focus group, including demographics, preferred involvement in decision making about screening (control preferences scale),49 and items to assess basic background knowledge and understanding of content presented (see appendix 3 on bmj.com for key items from questionnaires 1 and 2). JH conducted a brief telephone interview with a randomly selected third of the focus group participants in each age category (n=18) at one to four weeks after their session to identify whether views about overdiagnosis had changed and to elicit any responses that women might prefer to express privately. We asked whether the women had any further thoughts or feelings, since their focus group, about the information presented and their screening intentions. As the views expressed during follow-up telephone interviews presented no new data further to the focus group discussions, they were not analysed further. Fifty women participated in eight focus groups. Participants had diverse cultural and education backgrounds (table 1⇓). Each age stratum included women who had participated regularly in screening and others who had not. Three quarters of women in the target 50–69 year old cohort and 60% of older women knew they were eligible for free screening, whereas two thirds of women in their 40s either believed they were too young to access the programme or were unsure. About 80% of respondents desired active involvement in decisions about their breast screening participation. To illuminate the study findings presented below, we have selected representative participant quotations that illustrate both typical responses and the diversity of views expressed. The examples are labelled by participant number, age, and screening history, and are drawn from women with a variety of education levels. “That there are okay cancers, it’s something that we haven’t heard of before. It’s very new to me... here it is... in the statistics, but we don’t hear about it, not even from our doctors.” (Participant 15, age 47, 1 screen). “It could be dormant for years and years, and you wouldn’t know.” (Participant 49, age 78, 4 screens). We also assessed participants’ conceptual knowledge about overdiagnosis via two items in the written questionnaire administered at the end of each focus group. As shown in table 2⇓, most of the participants’ written responses indicated understanding of the key point that screening increases breast cancer incidence through the detection of non-threatening cancers. We marked women’s definitions of overdetection strictly according to the following scoring criteria. To score full marks, the response had to indicate that (a) a person has cancer, and (b) it may not cause harm or treatment may not be necessary. The “partially correct” scoring category covered responses that ranged from those indicating some limited understanding (such as “finding a lump that is benign”) to those that were close to achieving full marks (such as “when there is a cancer that is detected, but may have not changed if it was not detected”). The complete set of written definitions given by participants is provided in appendix 4 on bmj.com. “How do we know that things are being overdetected? How do we know that there are some cancers that move more quickly or become more malignant than others? ... Overdiagnosis assumes that these women, who have been overdiagnosed, have a cancer that is not necessarily aggressive ... Who determines what’s an aggressive and a non-aggressive cancer?” (Participant 33, age 62, 5 or more screens). “If you have a lump ... don’t they do a biopsy to check whether it is cancerous or not first? Yes and if it is, they would be able to tell you whether they are aggressive or not, right?” (Participant 11, age 46, 2 screens). “How do they find out? ... Have they studied a slow growing breast cancer to see how long it goes for or how do they know that?” (Participant 24, age 52, 1 screen). Box 2 summarises the main issues around overdiagnosis that caused confusion or required clarification during the focus groups. How do you know that there are cancers that will not progress fast enough to cause the woman any harm in her lifetime? Why is it not possible to distinguish these non-threatening cancers from the potentially dangerous ones that require treatment, even after biopsy or surgical removal of the cancer? How can overdiagnosis be quantified if we cannot identify the individual overdiagnosed cases? “So you have to go through all the rigmarole of chemotherapy, radiation, all that sort of thing, and it may not have been necessary, and those in themselves are hard to go through.” (Participant 09, age 45, 0 screens). “To me it’s not ‘over’ ... I don’t believe in ‘overservicing’ ... I think this is a terrible word to use because I think it’s a bullying word that people think they’ve been pushed into doing something that’s not relevant.” (Participant 05, age 43, 1 screen). “I think what they’re trying to do here is cut out breast screening ... or cut out the funding. ... I would hate to see the funding cut for mammograms. I think it’s really important that we keep it up, if that’s what all this is about.” (Participant 34, age 67, 5 or more screens). In responding to our introduction to the concept of overdiagnosis, only one woman explicitly asked for quantitative information about its frequency of occurrence. “I don’t know, makes me a bit scared now to go for a mammogram.” (Participant 12, age 46, 0 screens). “I still think the deaths are high, so I prefer taking the risk of [being] ‘overdetected’ than ... risk of dying.” (Participant 15, age 47, 1 screen). “If it’s in the 10% range, then I will say, ‘Yeah, just go ahead and do it.’” (Participant 11, age 46, 2 screens). “Fifty per cent, that’s a huge number. … I do voluntary work at [hospital], and [the patients having cancer treatment] look dreadful and they feel dreadful. ... I hate to think of 50% of people going through all that awful treatment for no reason.” (Participant 42, age 72, 3 screens). The figure⇓ illustrates a range of ways in which women responded to the 50% overdiagnosis scenario. Some women were prompted to reconsider whether screening was likely to be worthwhile for them personally—that is, taking into account their own perceived risk factors for breast cancer (such as family history, breast feeding, the pill, breast self examination, lifestyle, stress). The discussions suggested that if the rate of overdiagnosis was about 50%, some participants might decline screening altogether. More commonly, women suggested that they might delay screening (particularly younger women) or be less concerned or rigorous in ensuring they attended within the recommended two year interval. Notably, women often presented this as a relatively minor change in their screening intentions. For one woman, the 50% overdiagnosis estimate had the effect of undermining her confidence in mammography as a screening tool and stimulating a search for other screening modalities. However, some women indicated that the information did not at all affect their feelings that mammography screening was worthwhile. A few declared that they would still participate in screening regardless of an even higher overdetection risk, and even while interpreting 50% as a high rate in itself. “It does make a difference. ... I’d think about it a lot more with the 50%, whereas 30% I’d probably do it more easily.” (Participant 24, age 52, 1 screen). We also observed a relationship between previous screening attendance and the extent to which information about overdiagnosis seemed to influence perceptions of screening. Regular screeners tended not to alter their positive screening intentions after learning about overdiagnosis, whereas women with less screening experience seemed more concerned about the issue. “I think screening is ... something you go through to have a peace of mind. But as to ... after that, if you are diagnosed, then you have to weigh and look at the various options that you have.” (Participant 11, age 46, 2 screens). “It doesn’t turn me off the screening, but I would certainly, probably second-think the treatment. Not that I wouldn’t get it done, I probably may take a bit longer to think about it.” (Participant 16, age 47, 0 screens). There were suggestions that awareness of overdiagnosis (that is, knowing that not all cancers progress and need treatment) might help newly diagnosed women to feel less afraid and more hopeful about their prognosis. Some participants felt that this knowledge might also give such women more of a sense of control and reduce the pressure to follow a predetermined disease management pathway. “That 50% is not good information ... because if I was told ... I’ve got cancer, I won’t want to have in the back of my mind, ‘Oh well, it might not be, and I’m going through all this and my family’s all going bananas for nothing.’” (Participant 42, age 72, 3 screens). “For me ... if I’m going to do it, I don’t care about [the overdetection rate].” (Participant 35, age 69, 5 or more screens). “I really think it’s good to know the downside of overdetection. ... That information [is] not discouraging me to ... screen, but it just made me feel I have knowledge. ... I feel it’s really good.” (Participant 18, age 49, 0 screens). “I just want [my doctor] to say, ‘You should go, you must go ... this is where you go.’” (Participant 12, age 46, 0 screens). “I’d like to be encouraged to have screening. I’d also like to be armed with all the information.” (Participant 33, age 62, 5 or more screens). “I would actually say that women are entitled to know. ... How you act upon it is probably neither here nor there. It’s not a bad thing, perhaps, if that reminder [letter every two years] comes with this information attached to it—or any new information, for that matter, that might arise.” (Participant 17, age 48, 1 screen). “They’re going to confuse the people. ... All this hard work they’ve been doing for years, encouraging people to have mammograms ... now you are saying today, ‘If you want to you can do it, but see it’s your choice, see the percentages and you make your own decision.’... Years and years saying, drumming in, ‘You should have this every two years,’... and now you come out and say, ‘Look, they are the percentages, think about it if you’re going to go and do it.’ You are confusing people.” (Participant 35, age 69, 5 or more screens). “I don’t think a vast wad of information should be pushed on everyone willy-nilly, but people should be made aware that the information is there if they would like it ... this might help you make a decision. But I’d want to be made aware that there was information that I can and should look at, should I choose to.” (Participant 29, age 59, 5 or more screens). In this community sample of women eligible for mammography screening, awareness of overdiagnosis of breast cancer was minimal, consistent with earlier quantitative survey research.31 32 However, most participants were able to understand the issue after the explanation we presented and the opportunity to have their questions addressed. Although virtually everyone reacted to the information about overdiagnosis with surprise, effects on women’s screening attitudes were diverse. Some women expressed a commitment to screening that was unaffected by learning about the possibility of overdiagnosis, while others wanted to take this information into account and give further thought to their screening choices. The screening intentions expressed by these women depended heavily on the magnitude of overdiagnosis, with the highest estimate (50%) having a distinctly greater impact than both the lower and intermediate estimates (1–10% and 30%). Most participants felt that this information was important and should be available to enable women to make informed choices, although many also wanted to be encouraged to have screening. Importantly, for some participants the information on overdiagnosis caused uncertainty not about whether to have screening but rather whether to have standard treatment for a screen detected cancer or consider alternative approaches (such as watchful waiting or unproven therapies). There was also the suggestion that, for women who were treated for breast cancer, being aware of the possibility of overdiagnosis might make it more difficult to endure unpleasant side effects because of uncertainty about whether treatment was really needed. Learning about overdiagnosis in mammography raised interest in seeking alternative forms of breast screening (such as ultrasound scanning) either instead of or in addition to mammography. Several participants expressed concern about other women inappropriately being deterred from screening altogether because of overdiagnosis. Moreover, some were suspicious about an agenda behind overdiagnosis research—including our own study—fearing a government plan to cut funding for mammography screening. The strategy for communicating about breast cancer screening in the UK is currently under review. By examining lay women’s perspectives on overdiagnosis, this study makes an important and timely contribution to the debate about the possible consequences and value of providing overdiagnosis information to women invited for screening. The focus group presentation was carefully developed to be both accurate (that is, evidence based data) and understandable (such as innovative illustrations of the concepts), and was expert reviewed and extensively pilot tested. We presented the cumulative probabilities of different screening outcomes using natural frequencies, in line with evidence based recommendations.47 We explored responses to a diverse range of overdiagnosis estimates, reflecting the full body of existing literature, because the amount of overdiagnosis is contested and all estimation methods are subject to bias.9 The qualitative design is a strength of this exploratory study because it allowed unanticipated findings to emerge (such as the impact on decision making about accepting treatment for detected cancer). Encouraging women to ask questions also provided new insights into points of confusion. We tried to minimise volunteer bias by recruiting directly from the general community, and our provision of financial compensation helped us to achieve a broad sample including women from diverse socioeconomic backgrounds who varied in age, education, prior screening, and ethnicity. However, as the sample was not designed to be statistically representative, we cannot conclude that our findings reflect general population views. We stressed our neutrality at the start of each session to mitigate against “socially desirable” comments in favour of screening. In comparison with earlier attempts to introduce the concept of breast cancer overdiagnosis to women,31 33 34 this study involved a much more thorough explanation of the issue and its magnitude, albeit in a more resource intensive manner. The purpose of the focus groups was not to imitate a “real life” setting but to allow us to explore the process through which women understood and responded to information about overdiagnosis, thereby providing valuable insight into women’s attitudes. In our diverse sample (including women with low education and non-English speaking backgrounds) most participants’ written definitions of overdetection showed full (60%) or partial (24%) understanding of the concept. However, some participants (several of whom, though reasonably fluent in English, were from other language backgrounds) did not demonstrate a clear understanding of overdiagnosis, which limited our ability to accurately gather their views about it. For such women, an individual counselling and interview session may be a more appropriate way to explain the issues and examine their responses. Importantly, in this study we asked women about their own screening intentions as opposed to their views on national screening policy.35 Earlier qualitative research with women diagnosed through screening found that they considered it important to take into account, when making screening decisions, the possibility of being diagnosed with an ultimately harmless condition.25 Our study showed that this view, expressed by breast cancer patients whose perspective on screening would have been coloured by their personal experience of cancer, was shared by many women in the general invited population. This study provides important insights into lay interpretations of information about overdiagnosis, with implications regarding how best to inform people about the issue. Firstly, the magnitude of overdiagnosis matters, with many women indicating that their screening behaviour may change depending on the trade-off between the chances of benefit and harm.50 The wide variation in published estimates (1% to 50%) is therefore problematic. Additionally, the suggestions from some women that overdiagnosis would be relevant to their decisions only if they were actually diagnosed with a screen detected cancer reveal a concerning misconception that a screening mammogram is a separable event from the cascade of investigation and intervention that may be triggered by an abnormal result. This highlights the need to explain clearly to women that once cancer is detected, evidence based treatment is virtually always indicated because potentially threatening cases cannot be differentiated from those representing overdiagnosis. Communicators must also take care not to create a situation in which women think they can avoid overdiagnosis by choosing a different screening method (for which evidence is limited) or by supplementing screening mammography with additional testing, which may increase the potential for overdiagnosis. Thus the ethical imperative to provide information about overdiagnosis must be balanced with the responsibility to address misconceptions that may lead to problems in clinical practice. Another important point to consider in developing strategies for communication about overdiagnosis relates to understanding how people interact with new information. A theoretical framework used in the field of education known as schema theory41 highlights that the way people engage with new material is influenced by their “schema” (existing topic knowledge and expectations). In the case of mammography screening, attitudes tend to be strongly favourable, which is partly a function of the historical and cultural context. Women’s attitudes will have been shaped through the information presented to them directly by screening services as well as their broader experience of many years of widespread public health campaigns focused on promoting the benefits of screening without explaining the harm of overdiagnosis.27 29 32 The very existence of overdiagnosis runs contrary to prevailing notions of cancer and screening. Therefore it is reasonable to expect that new messages about overdiagnosis will not necessarily be immediately understood by everyone and may provoke confusion or scepticism, as we found to some extent in our study. Rather than wishing to be informed in detail about the range of possible outcomes of screening, some participants expressed a preference to receive more basic information together with encouragement to have screening. Such preferences are consistent with the “consider an offer” approach,51 in which screening is offered with summarised key information and people are assisted to evaluate whether taking up the offer is right for them. 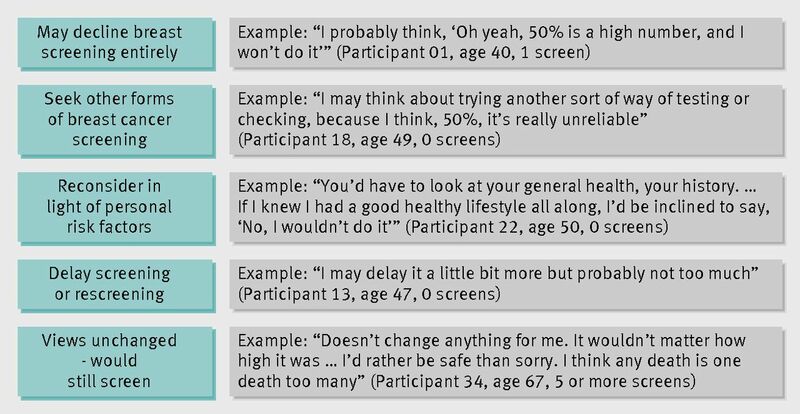 At the same time, people can be encouraged to consider whether they want to access more detailed information that may help them make a choice.51 Public views and information needs may change over time as more balanced screening information and increased awareness of harms contribute to changing the schema of expectations people have about screening. Moreover, the diversity we found in women’s responses to overdiagnosis supports the need for information providers to tackle the challenge of developing ways to deliver screening information flexibly rather than assuming that women’s needs are homogenous. Overdiagnosis was unfamiliar to a diverse sample of women eligible for mammography screening in Australia. None the less, we found it was possible to explain the issue in such a way that most participants understood the concept and its implications. Women’s screening preferences were sensitive to the estimated level of overdiagnosis, underscoring the need for urgent efforts to clarify this issue. Critically, women differed in the way they evaluated the relevance of overdiagnosis in making their personal decisions about screening. Some felt that the new information was unlikely to change their existing attitudes and intentions; others considered it important to take the risk of overdiagnosis into account, particularly at higher estimates. Many women expressed a preference for this information to be more widely available. However, their responses to being informed about overdiagnosis also revealed a range of potentially unwanted consequences that communicators must address. Finally, the diversity of views elicited in this study highlights the inappropriateness of making screening policy and communication decisions based on speculative assumptions about what women want and think regarding overdiagnosis. Instead, it is vital that research efforts continue to better understand women’s values about overdiagnosis, to clarify its influence on their behaviour, and to determine the optimal methods to support informed choice in mammography screening. We thank Bruce Armstrong for helpful comments on the draft presentation, the Hunter Valley Research Foundation for recruitment services, Sara Young for transcription services, Paul Glasziou and Jenny Doust for helpful comments on the presentation slides, Lucie Rychetnik and Stacy Carter for helpful discussion regarding the analysis, Ray Moynihan for helpful comments on the draft manuscript, and all study participants. Contributors: KM conceived the study. KM, AB, JH, JJ, LI, KH, and NH were involved in designing the study and developing the methods. JH, KM, AB, JJ, and LI obtained funding. JH coordinated the running of the study and conducted the focus groups, together with JJ and KM. JH, JJ, and KM read transcripts, developed the analytical framework, and contributed to the analysis. JH drafted the manuscript. All authors contributed to the interpretation of the analysis and critically revised the manuscript. All authors are guarantors. Funding: This work was supported by a fellowship grant (No 0189-1) awarded to JH from the Informed Medical Decisions Foundation and a grant (No 633003) awarded to the Screening and Test Evaluation Program from the National Health and Medical Research Council of Australia. The funders had no role in the design or conduct of the study; in the collection, analysis, and interpretation of the data; or in the preparation or approval of the manuscript. Ethical approval: The University of Sydney human research ethics committee approved this study (No 13085). Each participant gave signed consent immediately before the focus group. Jorgensen KJ, Gotzsche PC. Who evaluates public health programmes? A review of the NHS Breast Screening Programme. J R Soc Med2010;103:14-20. Gummersbach E, Piccoliori G, Zerbe CO, Altiner A, Othman C, Rose C, et al. Are women getting relevant information about mammography screening for an informed consent: a critical appraisal of information brochures used for screening invitation in Germany, Italy, Spain and France. Eur J Public Health2010;20:409-14. McPherson K. Screening for breast cancer: balancing the debate. BMJ2010;340:c3106. Heath I. It is not wrong to say no. BMJ2009;338:b2529. Thornton H. Pairing accountability with responsibility: the consequences of screening ‘promotion’. Med Sci Monit2001;7:531-3. Independent UK Panel on Breast Cancer Screening. The benefits and harms of breast cancer screening: an independent review. Lancet2012;380:1778-86. Wu D, Perez A. A limited review of over diagnosis methods and long-term effects in breast cancer screening. Oncol Rev2011;5:143-7. Puliti D, Duffy SW, Miccinesi G, de Koning H, Lynge E, Zappa M, et al. Overdiagnosis in mammographic screening for breast cancer in Europe: a literature review. J Med Screen2012;19(suppl 1):42-56. Kalager M, Adami H-O, Bretthauer M, Tamimi RM. Overdiagnosis of invasive breast cancer due to mammography screening: results from the Norwegian screening program. Ann Intern Med2012;156:491-9. Jorgensen KJ, Gotzsche PC. Overdiagnosis in publicly organised mammography screening programmes: systematic review of incidence trends. BMJ2009;339:b2587. De Gelder R, Heijnsdijk EAM, van Ravesteyn NT, Fracheboud J, Draisma G, de Koning HJ. Interpreting overdiagnosis estimates in population-based mammography screening. Epidemiol Rev2011;33:111-21. Junod B, Zahl P-H, Kaplan RM, Olsen J, Greenland S. An investigation of the apparent breast cancer epidemic in France: screening and incidence trends in birth cohorts. BMC Cancer2011;11:401. Zahl P-H, Strand BH, Maehlen J. Incidence of breast cancer in Norway and Sweden during introduction of nationwide screening: prospective cohort study. BMJ2004;328:921-4. Duffy SW, Tabar L, Chen TH, Yen AM, Dean PB, Smith RA. What information should be given to women invited for mammographic screening for breast cancer? Women’s Health2006;2:829-33. Barratt A, Trevena L, Davey HM, McCaffery K. Use of decision aids to support informed choices about screening. BMJ2004;329:507-10. Bell RJ, Burton RC. Do the benefits of screening mammography outweigh the harms of overdiagnosis and unnecessary treatment? - No. Med J Aust2012;196:17. Elmore JG, Fletcher SW. Overdiagnosis in breast cancer screening: time to tackle an underappreciated harm. Ann Intern Med2012;156:536-37. McPherson K. Publicity of NHS breast cancer screening programme is unfair. BMJ2011;342:d791. Prinjha S, Evans J, McPherson A. Women’s information needs about ductal carcinoma in situ before mammographic screening and after diagnosis: a qualitative study. J Med Screen2006;13:110-4. Bekker HL. Decision aids and uptake of screening. BMJ2010;341:c5407. Jorgensen KJ, Gotzsche PC. Content of invitations for publicly funded screening mammography. BMJ2006;332:538-41. Saalasti-Koskinen U, Makela M, Saarenmaa I, Autti-Ramo I. Personal invitations for population-based breast cancer screening. Acad Radiol2009;16:546-50. Zapka JG, Geller BM, Bulliard J-L, Fracheboud J, Sancho-Garnier H, Ballard-Barbash R, et al. Print information to inform decisions about mammography screening participation in 16 countries with population-based programs. Patient Educ Couns2006;63:126-37. Collins K, Winslow M, Reed MW, Walters SJ, Robinson T, Madan J, et al. The views of older women towards mammographic screening: a qualitative and quantitative study. Br J Cancer2010;102:1461-7. Schwartz LM, Woloshin S, Sox HC, Fischhoff B, Welch HG. US women’s attitudes to false positive mammography results and detection of ductal carcinoma in situ: cross sectional survey. BMJ2000;320:1635-40. Schwartz LM, Woloshin S, Fowler FJ Jr, Welch HG. Enthusiasm for cancer screening in the United States. JAMA2004;291:71-8. Mathieu E, Barratt AL, McGeechan K, Davey HM, Howard K, Houssami N. Helping women make choices about mammography screening: an online randomized trial of a decision aid for 40-year-old women. Patient Educ Couns2010;81:63-72. Mathieu E, Barratt A, Davey HM, McGeechan K, Howard K, Houssami N. Informed choice in mammography screening: a randomized trial of a decision aid for 70-year-old women. Arch Intern Med2007;167:2039-46. Paul C, Nicholls R, Priest P, McGee R. Making policy decisions about population screening for breast cancer: the role of citizens’ deliberation. Health Policy2008;85:314-20. Australian Institute of Health and Welfare. BreastScreen Australia monitoring report 2008-2009. Cancer Series No 63. Cat No CAN 60. AIHW, 2011. NHS Breast Screening Programme. Annual review 2011. NHSBSP, 2011. Hersch J, Jansen J, Irwig L, Barratt A, Thornton H, Howard K, et al. How do we achieve informed choice for women considering breast screening? Prev Med2011;53:144-6. Griffiths F, Bendelow G, Green E, Palmer J. Screening for breast cancer: medicalization, visualization and the embodied experience. Health2010;14:653-68. Willis K, Baxter J. Trusting technology: women aged 40-49 years participating in screening for breast cancer—an exploratory study. Aust NZ J Public Health2003;27:282-6. Anderson RC, Pearson PD. A schema-theoretic view of basic processes in reading comprehension. In: Pearson PD, ed. Handbook of reading research. Longman, 1984:255-91. Wilkinson S. Focus groups in feminist research: power, interaction, and the co-construction of meaning. Women Stud Int Forum1998;21:111-25. Ritchie J, Lewis J, eds. Qualitative research practice: a guide for social science students and researchers. Sage, 2003. Bowen GA. Naturalistic inquiry and the saturation concept: a research note. Qualitat Res2008;8:137-52. Kuper A, Lingard L, Levinson W. Critically appraising qualitative research. BMJ2008;337:a1035. Barratt A, Howard K, Irwig L, Salkeld G, Houssami N. Model of outcomes of screening mammography: information to support informed choices. BMJ2005;330:936. Akl EA, Oxman AD, Herrin J, Vist GE, Terrenato I, Sperati F, et al. Using alternative statistical formats for presenting risks and risk reductions. Cochrane Database Syst Rev2011:CD006776. Pope C, Ziebland S, Mays N. Qualitative research in health care. Analysing qualitative data. BMJ2000;320:114-6. Degner LF, Sloan JA, Venkatesh P. The control preferences scale. Can J Nurs Res1997;29:21-43. Welch HG. Overdiagnosis and mammography screening. BMJ2009;339:b1425. Entwistle VA, Carter SM, Trevena L, Flitcroft K, Irwig L, McCaffery K, et al. Communicating about screening. BMJ2008;337:a1591. Schonberg MA, McCarthy EP, York M, Davis RB, Marcantonio ER. Factors influencing elderly women’s mammography screening decisions: implications for counseling. BMC Geriatrics2007;7:26.